Ladyhawke (1985) | 'TAIN'T THE MEAT… IT'S THE HUMANITY! I’m a big fan of Fantasy movies, especially those from the 1980’s, and over the last few months I’ve been taking a closer look at some of my favourites. However, this week it’s the turn of a movie that isn’t strictly a Fantasy film, but is still well worth a closer look — Ladyhawke from 1985. Set in 14th Century medieval Europe the film centres on Navarre and Isabeau (played by Rutger Hauer and Michelle Pfeiffer), two star-crossed lovers labouring under a curse placed upon them by the jealous and obsessive Bishop of Aquila (John Wood). The curse is devastatingly simple: during the day Isabeau turns into a hawk, only to assume human form at night, while Navarre turns into a wolf at night and only regains his humanity in the morning. The lovers are doomed to be together in their natural state only during the few seconds of sunrise and sunset — always together, but eternally apart. Thrown into the story is Gaston (Matthew Broderick), a petty thief who has escaped from the dungeons of Aquila and is being pursued by Captain of the Guard, Marquet (Ken Hutchison). With the help of Navarre and Isabeau in her hawk form, he narrowly avoids arrest and accompanies the pair hoping to aid them in their quest to lift the curse. They engage in a few adventures before discovering that the curse can indeed be broken: if Navarre and Isabeau stand in the presence of the evil Bishop during an eclipse (on a day of both night and day) the curse will be lifted. Luckily just such an eclipse is imminent and so the pair face-off against the Bishop, the curse is lifted, evil is vanquished and the pair are reunited. Ladyhawke was directed by Richard Donner (The Omen, Superman The Movie) and co-written by Tom Mankiewicz (Live and Let Die and The Man with the Golden Gun). The film was a passion project of Donner’s and overall he does a decent job: the film moves along at a fair clip, the action scenes work well (especially the sequence in the monastery) and it’s all jolly good fun. 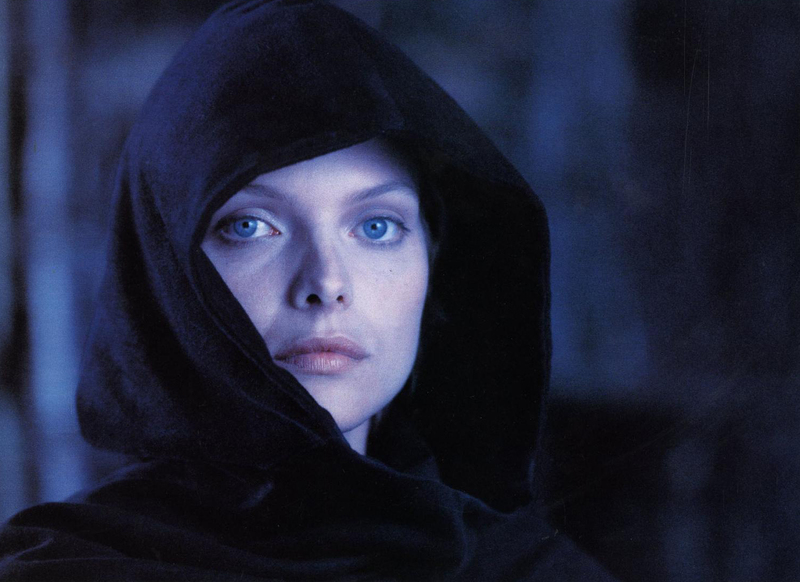 Ladyhawke was shot in Italy, and Donner and Cinematographer Vittorio Storaro (Apocalypse Now and The Last Emperor) took full advantage of the lush Italian countryside to make Ladyhawke look as visually impressive as possible. The film was a major release for 20th Century Fox who plowed almost $20m into the film, a huge amount for 1985 and an almost unheard amount for a fantasy film. Thankfully, most of that money is up on the screen: Ladyhawke is a beautiful looking film. The cast also works well, with Pfeiffer’s ethereal charm contrasting nicely with Hauer’s grim determination. But it’s really Matthew Broderick who shines: he imbues Gaston with just the right amount of humour and cowardly courage, and pretty he much steals the film. As entertaining as Ladyhawke is, the film is not without its problems. A couple are minor, but one is so huge that it almost scuppers the movie. I’ll come to that in a little while, first let’s look at the minor issues. At the film’s core is the great love shared between Navarre and Isabeau —theirs is a love for the ages. The trouble is Hauer and Pfeiffer share so little screen time together (they are only reunited in the last two minutes of the film) that the audience never really buys into that romance. We’re told repeatedly told that they love each other but we never really feel it, and it doesn’t help that Hauer’s Navarre is a little too old for Isabeau. In fact there’s more chemistry between Pfeiffer and Broderick than there is between Pfeiffer and Hauer, mainly because they’re share so many scenes. It’s ironic that the movie’s central plot device— two lovers separated by a curse — also hinders the audience’s acceptance of the pair being lovers in the first place. 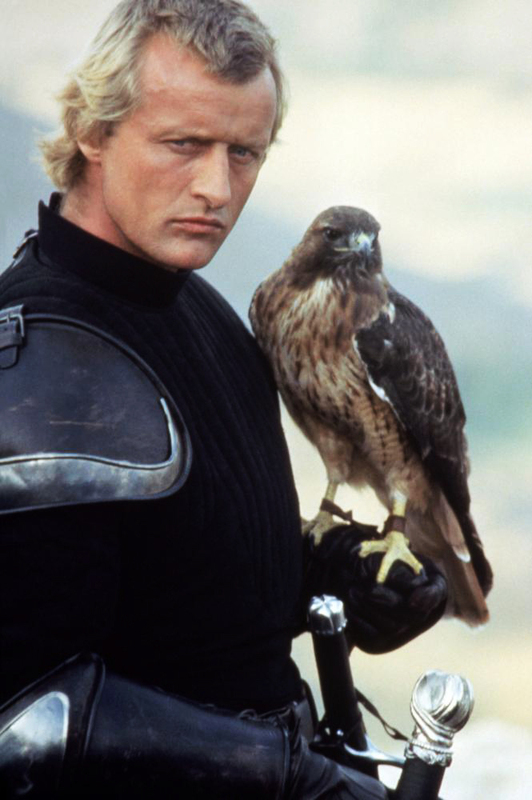 Navarre (Rutger Hauer) with Ladyhawke. My second gripe with Ladyhawke is it just doesn’t have enough Fantasy elements for my taste. This film is Fantasy with a small ‘f’, and I prefer my Fantasy writ larger than this. Placing the story in the decisively un-magical setting of medieval Europe doesn’t help; I prefer my Fantasy to be set in it’s own world, not ours. Apart from the curse itself there are no other fantasy elements to the story and that’s a shame. Dragonslayer is also set in a world recognisable as our own but the magical fantasy elements play a larger role in that film’s plot. Ladyhawke doesn’t even have enough fantasy ingredients to play out like a fairytale, instead it just falls between two stools: fantastic enough to warrant people changing into animals, but not fantastic enough to build an actual Fantasy world around. Navarre and Isabeau reunited at last. Finally, I have to address Ladyhawke‘s very own elephant-in-the-room, it’s biggest problem, and what almost sinks the film: its god-awful soundtrack. The music was written by Andrew Powell and produced by Alan Parsons (of The Alan Parson’s Project), and there’s no beating about the bush, it’s bloody awful. As soon as that horriblly upbeat rock guitar/synth music begins to play you know the film is in trouble. Not only does the soundtrack jar badly with the film’s medieval setting, it also distracts from the film’s more emotional scenes. If Ladyhawke sported a traditional orchestral soundtrack then the film would possess a wonderfully timeless quality to it. But the music the film is actually lumbered with could only come from a movie made in the mid-Eighties, and it dates the film horribly. In my review of Hawk the Slayer I also drew attention to the film’s score, which is actually more jarring than Powell’s music for Ladyhawke. But Hawk the Slayer was a cheaply produced British film that could only have been made in the early 1980’s, and it was dated the moment it was released. As a result it’s upbeat disco/synth score just adds to the film’s sense of cheesy fun. Ladyhawke on the other hand was a big-budget prestigious Hollywood movie — what were they thinking of by weighing it down with such terrible music? Powell only wrote the score for one more film (Rocket Gibraltar, 1988), and after hearing his work on Ladyhawke it’s not difficult to understand why. 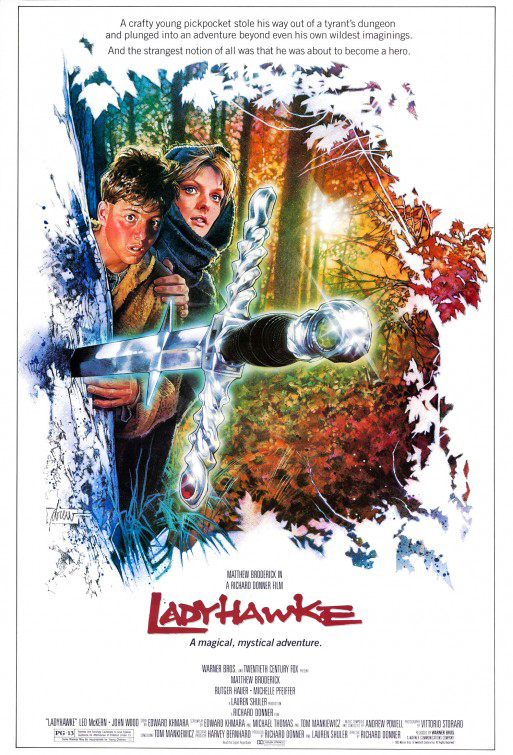 Crappy and misjudged music aside, Ladyhawke is a fun watch — a rainy Sunday afternoon family film if ever there was one. It may not fit comfortably in the genre of Fantasy films from the 1980’s — it’s not fantastic or violent enough for that — and it may not have achieved cult-status like many of its cheaper, more schlocky cousins, but it’s still well worth a go. Coming soon: Ralph Bakshi and Frank Frazetta team-up for the animated epic Fire and Ice, from 1983.